If you tuned in for the last post, you’ll remember that in all the wireless mesh troubleshooting fun, a wireless controller upgrade was required. Today’s post outlines the upgrade process from 6.5.0.1 to 6.5.1.7 with a primary and secondary controller. As always when dealing with upgrades, your mileage may vary. Never forget to read the release notes, and when in doubt, contact TAC. As with any upgrade, the release notes often contain subtle details, and these are typically details that bite back if you miss them. The notes for 6.5.1.7 are pretty straightforward, but they do include exciting, not to be missed, caveats if upgrading from 6.4.x, as well as some solid tips for the upgrade. The best practice advice in the notes includes steps such as confirming enough memory and storage space for the controller, making a backup of the configuration, and noting the number of active access points before upgrading. All of these suggestions make prudent sense and the commands to do so are listed in the guide. You can use a FTP, TFTP, SCP, local file, or USB to do this upgrade, but the guide warns against using a Windows-based TFTP server. I used FileZilla FTP server. 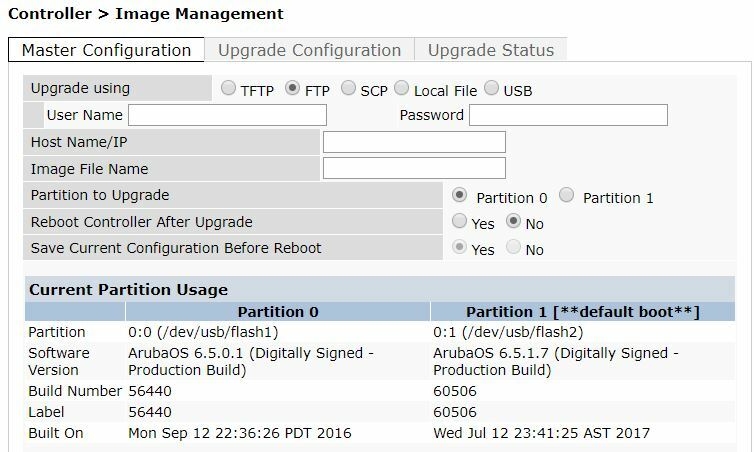 Once you’ve downloaded the image file from Aruba and your pre-upgrade checklist is complete, navigate to Maintenance > Controller > Image Management -> Master Configuration. Pick the file loading option you want to use for the upgrade, then fill in the required details for the transfer. Choose the non-boot partition for Partition to Upgrade. This will load the new software image to the inactive partition. If you are uncertain which one is the boot partition, look under Current Partition Usage, one partition will be marked **default boot**. You will want the other one. Be sure that Reboot Controller after Upgrade is set to No, unless you have a single controller and eat danger for breakfast. Select Yes for Save Current Configuration Before Reboot, and click Upgrade. At this point, you rinse and repeat for the other controller(s). Once the controllers have the upgrade version loaded, you reboot the master, and simultaneously reboot the other controller. In voice upgrade world, you have been well trained to wait FOREVER for all the services to come back up on the primary before even considering a reboot of secondaries, but in Aruba wireless world, simultaneous is written in the guide. See excerpt below from the 6.5.1.7 Release Notes available on the Aruba support site. TAC did ease my anxiety over this simultaneous reboot thing by letting me know no harm would be caused if I wanted to wait for the master to come back online completely before proceeding. After the controllers reboot and are back online, access points begin getting their new firmware and rebooting. Once the dust settles, you should end up with the same number of active APs as you noted in the beginning. Then it’s all testing and confirming access points are happy, clients are connecting, and that all is well your WiFi world.